Simple yet extremely powerful sport software for managing all aspects of sporting competitions. This effective sporting software stores all your teams and divisions organised into competitions, allowing you to quickly view and modify information as required. Useful reports make use of the data & results entered. Print fixtures week by week or a season at a time, ladders, history reports, results, scoresheets, umpire duties, financial reports and more. 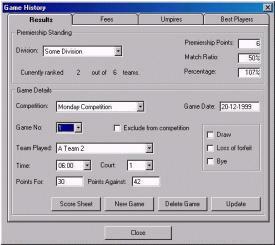 Phoenix Fixtures allows you customise each division's draw to suit any change in teams. This incredible sport software also allows you to edit generated draws - you can add, remove or swap games, change allocated courts and/or timeslots and much more !!! Suited to any sport - basketball, netball, football, baseball, hockey - try it with your sport today. Superior competition management means you can retrieve and print past results,daily game sheets, statistics and other information with a click of the mouse. Team playing statistics, including wins, losses, draws, byes, forfeits, courts played and times played are available at any time. You can set particular timeslots or courts that a team will not be fixtured on (team players may work or have other commitments) as well as being able to create, change or delete existing fixtured games... its so easy ! Generating sport draws has never been easier: Select the week, select the competition and press Generate ! You can of course AutoGenerate upto 18 weeks at a time. 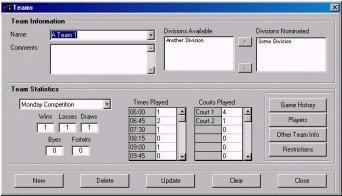 Court and timeslot allocations are random, Phoenix Fixtures will endeavour to provide the most even placement possible. Super easy results data entry makes results entry quick and simple. Enter the best players, fees and umpires at the same time to save time! Comprehensive reporting including reports showing fees expected/received from games by competition, sport, division and even by team ! Don't forget the Best Player with votes, results and score sheets and informative Daily Sheet with games, divisions, sport, umpires and byes! Phoenix Fixtures v3.0 sports software lets you manage your competitions like never before offering the ability to edit draws before generating the games and creating your own fixture draws - point and click! To really appreciate the ease of use and enormous benefits you MUST see it in action or try it for yourself. For a demonstration at your site, or for a free evaluation copy drop us a line or e-mail today! Phoenix Fixtures sports software is a proven performer fully endorsed by the Leschenault Leisure Centre, Australind Western Australia. Ideal for all sports from basketball to hockey, this software is a must have for any recreation facility or association who wants to streamline their sports competition management. We are committed to providing the perfect software solution, any feedback or suggestions are welcome so we are able to make Phoenix Fixtures even more powerful and user friendly. Just let us know what we can do to make Phoenix Fixtures work for you ! Purchase a Support License to make sure your software is always up-to-date. This also gives you access to e-mail and telephone support during normal office hours. Having a Support License means you receive all major and minor software updates - never update your software again ! If you require specific reports or functionality we can customise Phoenix Fixtures for your particular facility - Call or Email Now for more information. 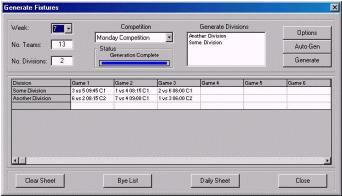 Phoenix Fixtures has been tested to run under Windows 95, 98, NT and 2000. Click here to fill out our online information request form. There are a number of Support Contracts available, depending on the size or requirements of your business. Development of custom software applications using Microsoft Visual Basic and the Microsoft Office suite of tools.